Bulldog Scrubbers...Green, Clean & Mean! Bulldog has been providing cleaning equipment for America’s toughest applications for decades. They have been frustrated in recent years by the lack of heavy duty equipment for smaller applications. 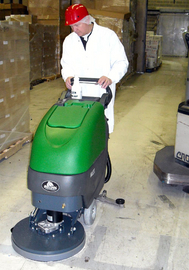 Most compact auto scrubbers available today are not designed for heavy daily use. Their goal was to make an easy-to-use, tough scrubber for those applications at an affordable price. We believe Bulldog met those goals and we are proud to be the exclusive dealer for Bulldog Scrubbers. Bulldog Scrubbers is an American made company building high quality, economical scrubbers. All units come with a 3 year parts warranty. Give us a call today to get more detailed information on the Bulldog Scrubbers! Take a closer look at the Bulldog Scrubber. The American-made quality is easy to see! Call us today at 800-354-5541 for a FREE demonstration.